It was good to be with so many of you in Belfast for National Police Memorial Day 2018. The feedback from the event has been overwhelmingly positive and encouraging. We are grateful to those who contributed to making the Day meaningful for all who attended especially those who gave of themselves and took part in our Service and for those volunteers who ensured the Day went smoothly. It feels a bit like that at the international, national and local level in so many different ways. It can also sometimes be true at a personal level. The experience of sudden, unexpected, untimely bereavement is one which many in the NPMD 'family' share alongside the many different stages of grief that follow across the rest of our lives. As friends and families gather over the holiday I am mindful that for many of you the reality of an 'empty chair' at a meal or the silent absence of a loved one as you gather together can be very real, painful and emotional. It is difficult, sometimes impossible, to put things back together. Part of being associated with the NPMD 'family' is so you can, at such times, be assured of the thoughts and prayers of others with you. The 'seasons greetings' that come from this season are greetings of peace in the midst of pain and anxiety; of love that can triumph over fear and loneliness; of hope that can conquer despair; of light that dispels darkness; of life in the place of death and brokenness. The Christmas message is that God was born into the reality of our world - "and they shall name him Emmanuel," which means, "God is with us." Whatever we face, feel and experience 'God is with us'; this is a message of faith, hope and love in the midst of an uncertain and changing world. May the meaning at the heart of Christmas be known by you in these days. Every blessing upon you, your home and your loved ones -wherever they are - this Christmas and throughout 2019. Information about National Police Memorial Day 2019 to be held in Glasgow is below and I look forward to seeing you in September. Preparations for next year are well underway and we will look forward to welcoming those who have attended previous events as well as those who are attending for the first time. We have seen an increasing number of visitors from overseas who we also look forward to meeting again. 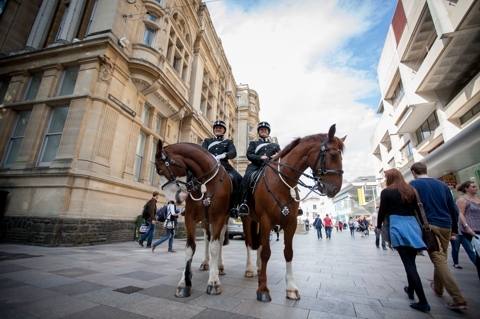 There are still many who do not know that NPMD is open to all who wish to attend and we would like to seek your help in not only publicising the service but also, on our behalf, inviting others who are able to join with us. We have made this newsletter electronic to enable you to forward this to as many others within the police family as you feel appropriate. This includes serving officers and staff, those who have retired and especially the families and friends of those who have sadly lost their lives over the years. All are invited and very welcome to attend. Next year's service will take place in Glasgow's Royal Concert Hall, Sunday 29 September. Built in 1990 for Glasgow's reign as European City of Culture, the Royal Concert Hall sits in an iconic position right in the heart of the city's bustling shopping district. There are plenty of hotels and a variety of transport links, which makes arranging travel and accommodation all the more easy. 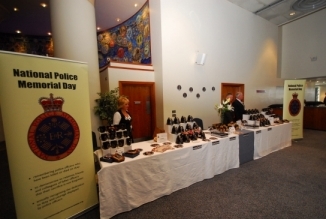 Glasgow last hosted National Police Memorial Day in 2011. Home Secretary Sajid Javid joined families, friends, colleagues, senior officers and government officials as they gathered to remember thousands of police officers who have died on duty or been killed in the line of duty as they were honoured at this year's National Police Memorial Day which took place on Sunday 30 September at the Waterfront Hall in Belfast. 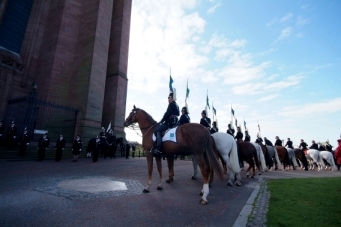 Nearly 2,000 guests were welcomed by a guard of honour formed by representatives from each force in England, Wales, Scotland and Northern Ireland as well as uniformed police officers from overseas forces. The Reverend Canon David Wilbraham, National Police Chaplain, led the act of remembrance, during which Sid Mackay, Chair of the Police Roll of Honour, laid a wreath to mark the centenary of the end of the First World War and in memory of the police officers called to service, who lost their lives. Representing Northern Ireland: Joseph Ferguson and Susan Ferguson O'Neill, brother and sister of Constable Michael John Ferguson, RUC, who was murdered by the IRA aged 21 years in 1993. Mark Lindsay, Chair, Police Federation for Northern Ireland, read the names of the officers who have died in the last year: Constable Steven Richard Jenkins, Gwent Police: Constable John Alcock, Grampian Police: Constable James Dixon, Thames Valley Police: Constable David Fields, South Yorkshire Police. There was silence in the auditorium as green, blue and red petals of remembrance descended from the gallery before the Last Post was sounded. You can view the highlights here. Registration will open from 1 January 2019, and you can register by clicking here. Tickets will also be sent to you [or your group leader] by e-mail. Admission into the event will be on the production of a valid ticket and appropriate photo-identification. When registering a group, invitations can be sent out to one address, provided that all names and addresses reflect each guest's form of identification that they will be asked to bring with them to gain access to the event (e.g. passport, driving licence). If you have any queries, please don't hesitate to get in touch - please email nationalpolicememorialday@polfed.org or call 07843 293958. Why not register to receive our e-mail updates .